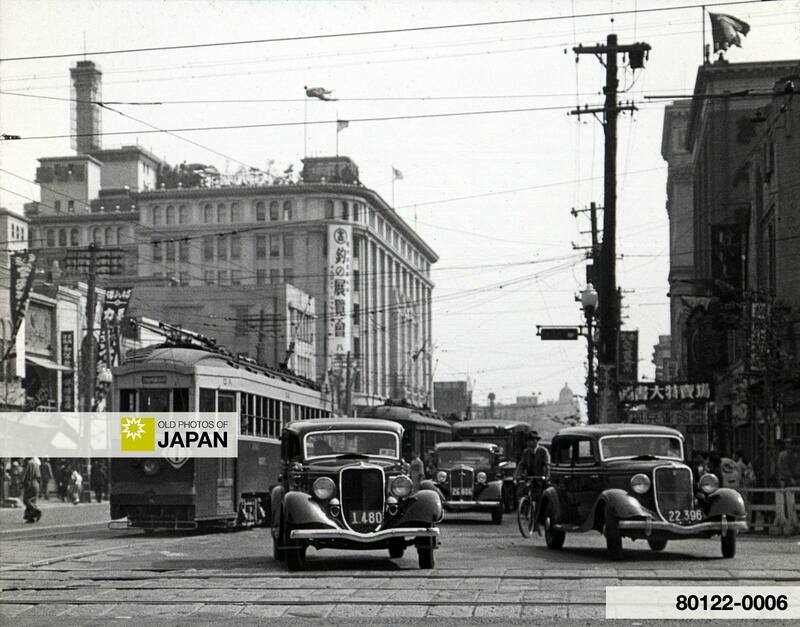 Cars and street cars on Chuodori in Nihonbashi in May 1934. The photographer took this photo from the intersection of Chuodori and Eitai-dori (永代道り). The building in the back is Takashimaya Department Store, which was founded in Kyoto in 1829 as a shop selling cotton cloth and used clothing. The same building is still used today. Chuodori is a wide shopping street that runs from Ginza to Nihonbashi. For information about Nihonbashi, read Tokyo 1890s • Koamicho, Nihonbashi. For more photos and information on Ginza, see Tokyo 1890s • Shinbashi Bridge, Ginza, Tokyo 1910s • Ginza and Tokyo 1910s • Hattori Building, Ginza. This glass slide is one of a series of slides of Japan that was used by the New York State Education Department to teach students about Japan. You can also licence this image online: 80122-0006 @ MeijiShowa.com.